Instead of putting away all the remaining strips and scraps from the string quilt, I decided to use them to make up this new quilt top. You may recall this quilt pattern – it was the first quilt I completed in 2009. I knew I wanted to make another one, and I kept picturing it with brightly colored scraps. I typically try to avoid using the exact same fabric combo in more than one quilt, but in this case I’m going with it, since I think the end result will be quite different. 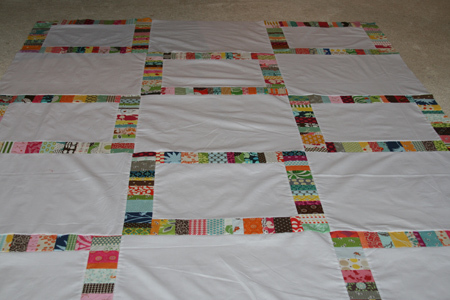 As opposed to the last quilt which used just a tiny bit of white, the majority of this one is white. So even though they use mainly the same fabrics, I don’t think you’ll you notice. 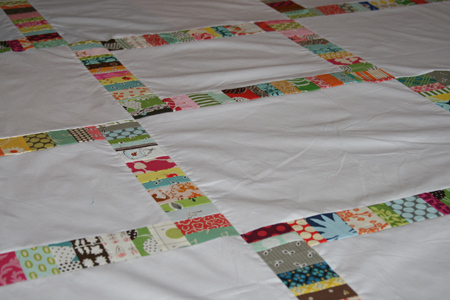 I sewed all the scraps together to form strips, cut them down to 3″ in width, and sewed these to solid white blocks. The measurements and info about the blocks can be found here. And now I better get busy making quilt backs. I’ve got a growing stack that need finishing! This entry was posted in Household Sewing - bags, napkins, pillows, Posts about Quilts and tagged handmade, quilt, quilting, scrap quilt. Bookmark the permalink. oOOOH! I really love this pattern…thank you for giving measurements. I’ll check them out, this looks like a quick moving project and a great way to use up scraps! It also reminds me of Denyse Schmidt’s single girl quilt…beautiful! This is gorgeous– I LOVE it! It is absolutely beautiful! They do look like two totally different quilts. Love love love! And no, you can’t tell at all that these are the same fabrics as the other quilt… they are so different and both wonderful! I have a quilt back aversion at the moment, but this morning I forced myself to make at least one. This would look so much next to our matching dish towels . . . hint, hint!!! You have a lot of my favorite fabrics in there, especially the Uptown Orange. I also love the three colorways of Amy Butler dots, the Joel Dewberry circles, the Heather Ross goldfish and all the Flea Market Fancy! 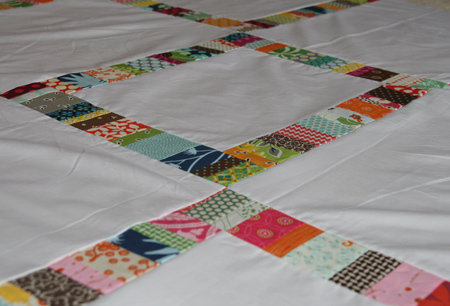 I love this quilt, what a great idea for scaps! That’s beautiful! I love, love, love this one!!! I keep seeing this one in my head made with monochromatic sets of scraps for a rainbow border look. This is lovely. It looks so different from the one done in the greens, I guess b/c there is so much more white. I really would love to try this. So the quilted strips are 3″ wide? They look much more narrow. this looks totally doable for my scraps! love it! I love it. I got my scraps from you today thanks so much I can’t wait to start using them. I love that! I don’t have enough scraps yer, but when I do I rreally want to try it! it’s gonna be a great one. some day we need to see a stack of all your beautiful quilts. You have made so many! I was going to say exactly the same as the first commenter – it reminded me of the Single Girl pattern. So simple and pretty! This is going to be seriously gorgeous!!! I love i. Really Ashley, when do you find the time? Wow. I don’t think you sleep! Love love and more love. I am using scraps in the same way, but not quite sure of the final plan yet. Just know it involves green, blue and gray. That is another beautiful quilt. I am so glad you share your measurements with us. After finding your blog and reading back, I came across the green quilt. I fell in love with it and after making 2 wonky star quilts for Tia I made 3 of these. A green, an orange and a pink one. These 3 will also be sent to Tia for the Busfire Quilt Appeal. Thank you so much for your generousity in sharing your designs with us. Beautiful. More scrappy goodness!! !….after being inspried by your picnic blanket i spend ALL weekend cutting my scraps into 1″ strips and what i lovely time i had! I have piles and piles of scraps. Some of them have been there forever as i don’t like them very much but as they say …. “no fabric is too ugly if you cut it up into small enough pieces”. 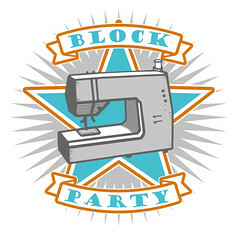 4 days weekend next weekend so i plan to spend most of it sewing them all together – can’t wait!!! oh, my! that quilt is FANTASTIC!!! i love love love this quilt. can i put a link on my blog to this gorgeous masterpiece in the making? Hi Ashley! You are a most excellent quilter!! I am glad I found your site. You have a real eye for color. 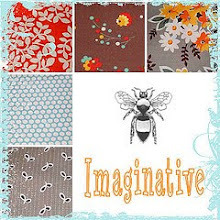 Do you get most of your fabric through the internet or do you have a good quilt shop in your area? I am in Montreal, and I would gladly head your way to check out any quilt stores you might recommend. Happy quilting!! !